My two nieces and I had enjoyed a fun, fast and furious expedition to New Orleans, but our two day whirlwind trip wasn't quite over. On the morning we were leaving Louisiana to head home, we managed to squeeze out one last little bit of adventure and, well, food. Some of the restaurants we had considered for our last Louisiana meal (I know that sounds like we were on death row and planning for the last meal we would ever have, but we take our food seriously. We don't want to waste calories on sub par meals.) happened to be closed on Sunday, so we had to do a bit more research. After our marathon the day before, we decided to try to find something a little closer to the French Quarter. Luckily what we found was right in the heart of Jackson Square. The name of the restaurant was Stanley and it had great reviews. I was a little worried we might find getting a table difficult, since it was smack dab in the middle of the major tourist area, but we got lucky. We got there just at the right time. We had a small wait, but right after we got our names on the waiting list, we noticed that people were being given considerably longer waiting times. The restaurant used the No Wait app, which I thought was genius. Because the app is on your phone, you are not tied to a buzzer, which gives you the ability to shop and stroll around outside the restaurant without worrying that you are getting out of the buzzer's range. When my phone rang, telling us out table was ready, we quickly hurried over to get seated. The place was packed, but we got a comfy table near the front of the restaurant. We ordered drinks, studied the menu and made our choices. Haley got an omelette sandwich, but she left off the best parts of the sandwich...the bacon and the ham! Go figure! She seemed happy, though. Ayla went sweet with Bananas Foster French Toast. Heaven help me! It was breakfast and dessert all wrapped up in one magnificent creation. Battered French bread, sliced bananas, vanilla bean ice cream and toasted walnuts all drizzled with that New Orleans original, buttery, brown sugary, bananas foster sauce. Good golly, it was good! To offset all that sweet, Ayla got a bowl of savory bacon and cheese grits. They were delicious, as well. I couldn't leave Louisiana without one more order of oysters, so I chose Eggs Stanley, a decadent creation of cornmeal crusted oysters, perfectly poached eggs and Canadian bacon, smothered in Creole hollandaise sauce and piled on top of a toasted English muffin. It was Restaurant Stanley's Creole version of Eggs Benedict. My yummy entree was joined in holy matrimony with a plate of Creole hash browns. Trust me, it was a marriage made in heaven. I'm getting misty-eyed just thinking about how wonderful it was. Apparently we were not the only diners who were moved by our delicious breakfast at Stanley. These girls practically broke out into a song and dance. We left Stanley happy and fully fortified for our drive home, but we had one last stop to make before we hit the road. We bought a styrofoam cooler and dashed over to Central Grocery, the place where muffulettas were invented, to get a little taste of New Orleans to take home with us. 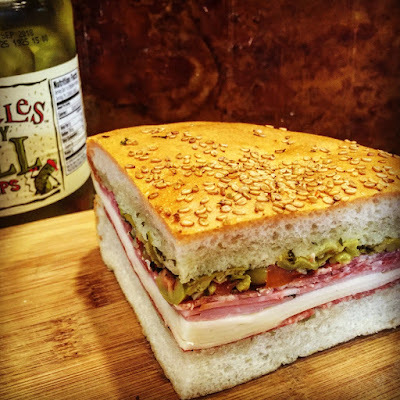 A muffuletta, for the uninitiated, is a large, round Sicilian sandwich, piled high with deli meats and cheeses and distinguished by a zesty olive salad that gets poured over the other fillings before the top layer of bread is added. When you visit Central Grocery, and it really is a speciality grocery carrying all sorts of Italian ingredients, you find yourself a spot at the back of the line of customers that snakes around the shelves and terminates at the counter where you place your order. Muffulettas can be ordered in whole, half or quarter portions. A quarter portion is a large meal for one person. A whole one could probably feed half the Duggars. Since we were going to be traveling, I wondered if I needed the olive salad on the side. I was worried the bread might get soggy. The answer is no. The gentleman behind the counter told me they ship the sandwiches all over the world with the olive salad in place and the sandwich would be just fine. He was right. When I got home, the sandwich was perfect...no sogginess whatsoever. So, that's it! 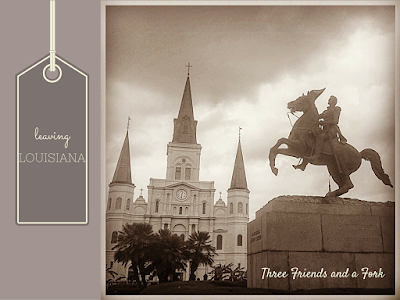 We had a great time in Nola and can't wait to visit again. In the meantime, Three Friends and a Fork give 3 hearty Yums UP to Restaurant Stanley and Central Grocery. Thanks for the memories New Orleans!